On 23 Jan., 1950, the 19-year-old Ms. Peters stood on the stage of the old Metropolitan Opera House on Broadway and 39th Street in Manhattan. There, in the darkened hall, she sang �Der H�lle Rache� from THE MAGIC FLUTE, which, with its fiendish series of high F�s, is among the canonical texts of the coloratura repertory. Somewhere out in the darkness was Mr. Bing. �It was the first audition I had done for anyone, and I was so scared�, Ms. Peters told The Chicago Tribune in 1993. �When it was over he asked if I would sing it again. Then he asked me to do it again. Well, I sang it four times, not knowing that he had silently brought in conductors Fritz Reiner, Fausto Cleva and Fritz Stiedry to hear me�. Peters made her impromptu Met d�but 17 Nov., 1951, substituting for Nadine Conner. �The delightful surprise of last night�s performance of DON GIOVANNI at the Metropolitan was the emergency d�but of little Roberta Peters in the part of Zerlina�, The New York World-Telegram�s review the next day said. �The voice came through the big house as clear as a bell, the notes equally bright and focused and the phrasing that of a true musician." "A conductor/composer much beset by a series of catastrophes, Jonel Perlea nonetheless ranks high among his contemporaries for the fervor and meticulous attention to sound and form he brought to his interpretations. Interned by the Nazis during WWII and later the victim of a stroke, he prevailed, teaching and conducting with a modified technique employing the left hand only. Recorded evidence causes one to wonder about Perlea's abbreviated time with the Metropolitan Opera, but stories of backstage jealousies suggest the answer. Perlea was invited to Bucharest to conduct the premiere of an orchestral work he had written and found himself intrigued by the possibility of a conducting career. His official debut as a conductor came in Leipzig where he led an opera house performance of the ballet PUPPENFEE and quickly thereafter, the opera HANSEL UND GRETEL. Following several other German engagements and a year's service in the Romanian army, Perlea was made first principal conductor at the Bucharest Opera in 1926 and later, the company's music director and director of the city's conservatory. Throughout the ensuing years, Perlea's reputation grew through guest appearances at Europe's leading opera institutions and with its finest orchestras. On their way from Bucharest to Paris in August 1944, Perlea and his wife were detained by Nazi officials in Vienna because they lacked the necessary visas. For the next year, they were placed in concentration camps, initially in Silesia, later in Körten. Upon liberation by British troops, Perlea was sent to Italy for repatriation; subsequently he chose to attempt the rebuilding of his career there. A substitute engagement with Rome's Santa Cecilia Orchestra was so well-received that he was given a second concert, this time with his name on the playbills. Another success led to an engagement at La Scala where his TRISTAN UND ISOLDe was acclaimed. Perlea remained a principal conductor at Milan until 1949, also leading performances regularly at Naples. After his American debut with the San Francisco Symphony in 1949, Perlea came to the Metropolitan Opera where his 1 December debut in TRISTAN drew high praise. 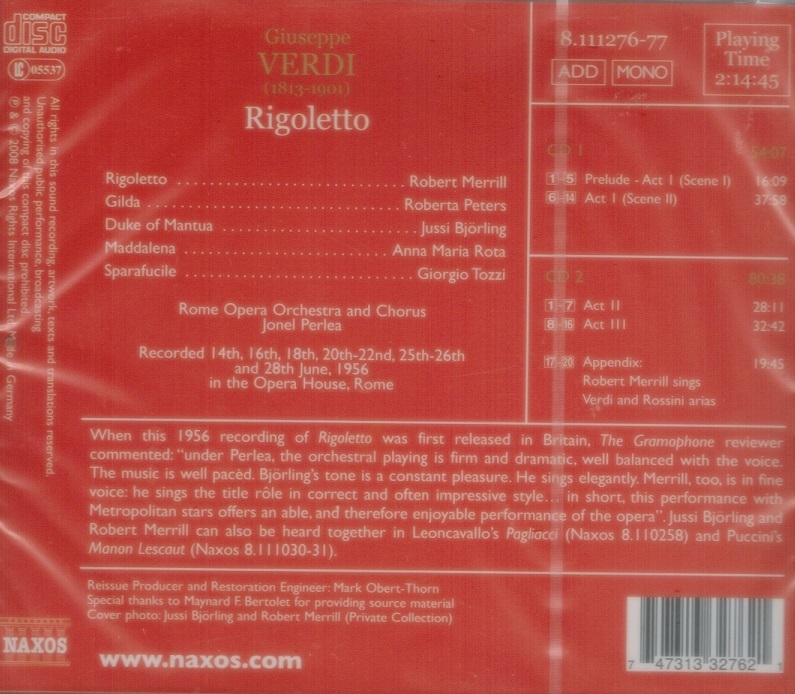 The refined and clearly defined orchestral textures bespoke an exceptional gift for leadership; he supported his singers rather than dominating them. 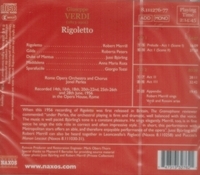 Similar high enthusiasm greeted his RIGOLETTO and CARMEN, but a failure to agree on repertory (the official story) led incoming manager Rudolf Bing to offer Perlea only one production for the following year. Perlea returned to Italy to continue conducting there, finding ongoing favor with critics and audiences alike and leading several important opera recordings. Now a naturalized U.S. citizen, he was appointed music director of the Connecticut Symphony Orchestra in 1955 and taught at the Manhattan School of Music. A heart attack in 1957 presaged a stroke that left him disabled but not defeated. He continued to direct with his left arm only and in 1967, led a production of TOSCA for the American National Opera hailed as extraordinary for its authority and intensity." 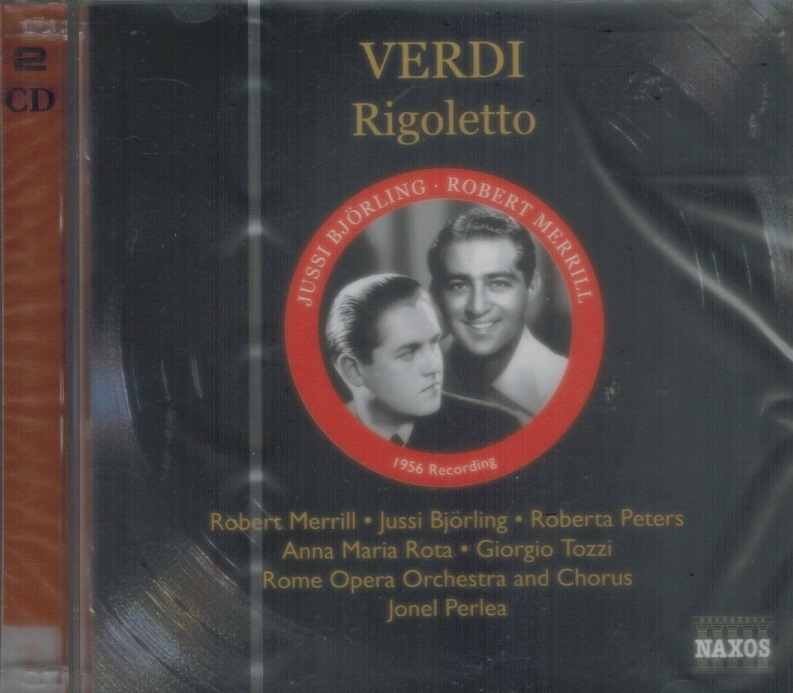 "It goes without saying that Robert Merrill's work was a vital part of what made the Met's Golden Age so golden; he was highly valued there for his vigorous, powerful, and technically unshakable singing, if not for his acting skills (which were never a priority). In 1993, he was awarded the United States Medal of Arts."